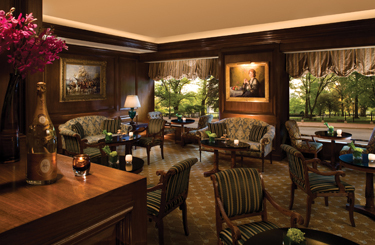 The Bar at Taj Boston is an intimate club-style space on Arlington Street at the corner of fashionable Newbury Street that is the spot for small business and social gatherings. With floor-to-ceiling windows overlooking the ever-changing Public Garden, warm wood paneling and a welcoming wood-burning fireplace in the winter months, The Bar is tailor-made for engaging conversation while enjoying small plates, a light meal or delectable desserts paired with your selections from the extensive list of cocktails, wines, Champagnes, beers and more. New high-top tables and custom music playlists set the mood for every occasion from casual lunches to late-night relaxation. An array of appetizers, soups, sandwiches and desserts is offered until 11 pm nightly. In addition, a special Evening Tapas menu is served from 5 pm. Favorites include the Middle Eastern Trio, featuring housemade hummus, tabouleh and falafel served with pita and tahini sauce; Salmon Tartare with lemon cream; and Chicken Kebab with mint sauce. Order one of The Bar's many cocktails or Champagnes by the glass and receive your choice of complimentary Tapas. Every month features new vintage red and white wines by the glass and bottle. Signature cocktails showcase the bartenders' mastery of both the classics and inventive new trends, from Sazeracs to martinis created in honor of Taj Hotel's authentic Indian palaces. Beers hail from Boston and around the world, such as Samuel Smith's Oatmeal Stout from the UK and Germany's non-alcoholic Clausthauler. For the single malt enthusiast, The Bar offers more than 20 pours of Scotland's finest, including a 25-year Macallan and a 25-year Glenfarclas. Or opt for a post-theatre indulgence: share the pastry chef's dessert selections of the day accompanied by a half-bottle of Veuve Clicquot Champagne.